I get excited when a fresh issue of a cooking magazine shows up in our mailbox- so much inspiration, so many recipes to try out! Check out which magazines we like to flip through on our “Blogs, Books & Magazines” page. I also like it when I have ingredients to make particular recipes, without having to break the bank- or keep visiting the grocery store. 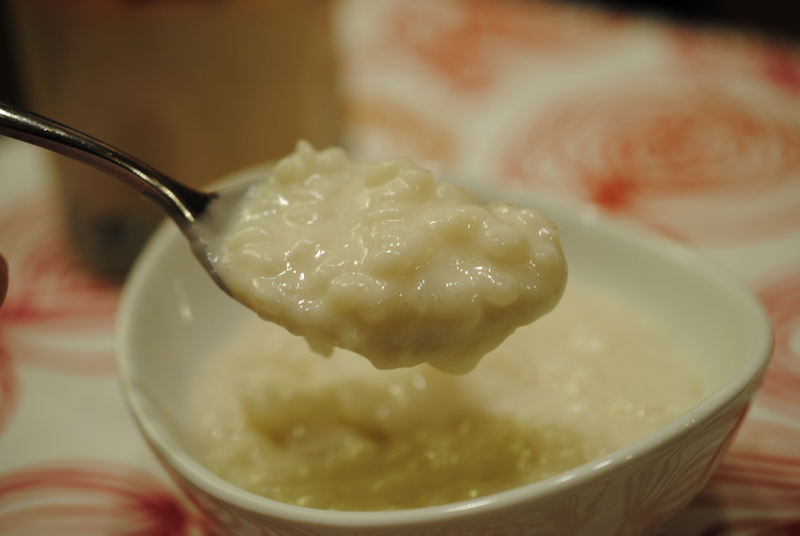 When I was flipping through the January issue of Food and Wine, I spotted a recipe for Almond-Milk Rice Pudding. Knowing that I had about the exact amount of sushi rice in our pantry I’ve been wanting to use up, I thought this would be the perfect dessert, or snack, throughout the week. The week prior, we had access to a car (thanks Carrie!) and I had bought various (delicious) items at Trader Joe’s. Two of them were almond and coconut milk. Not too familiar with these liquids? Almond milk is made from ground almonds, and a great substitute if you have dairy allergies. 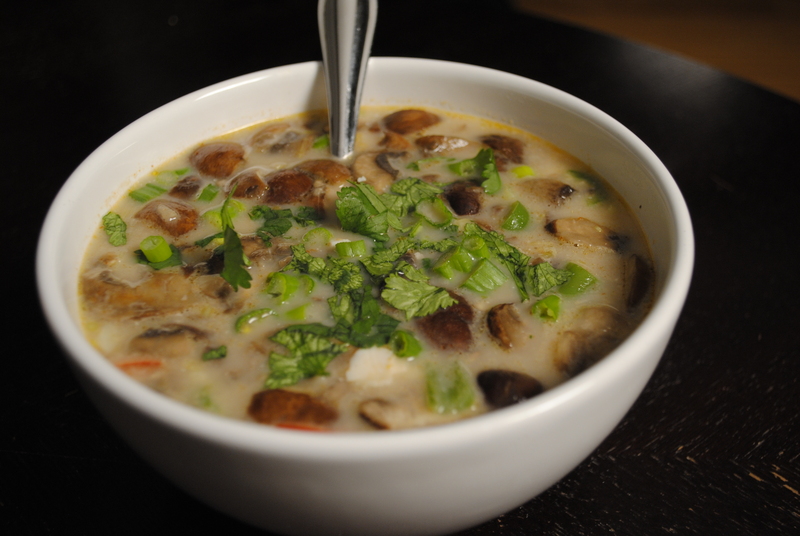 Coconut milk is made from grated coconut, also a great milk substitute, and used in many vegan and vegetarian dishes. I recommend using the unsweetened versions, making this a little healthier, and not overly sweet. 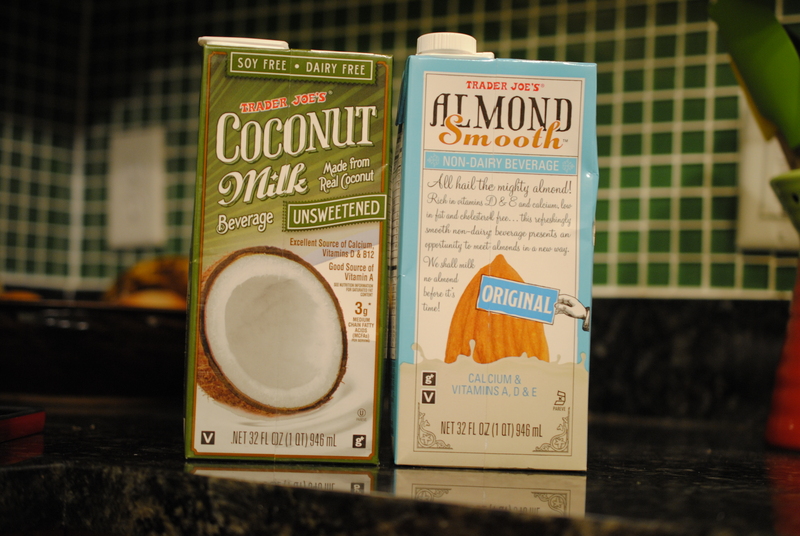 In a large bowl, or pitcher, combine the almond and coconut milks together. 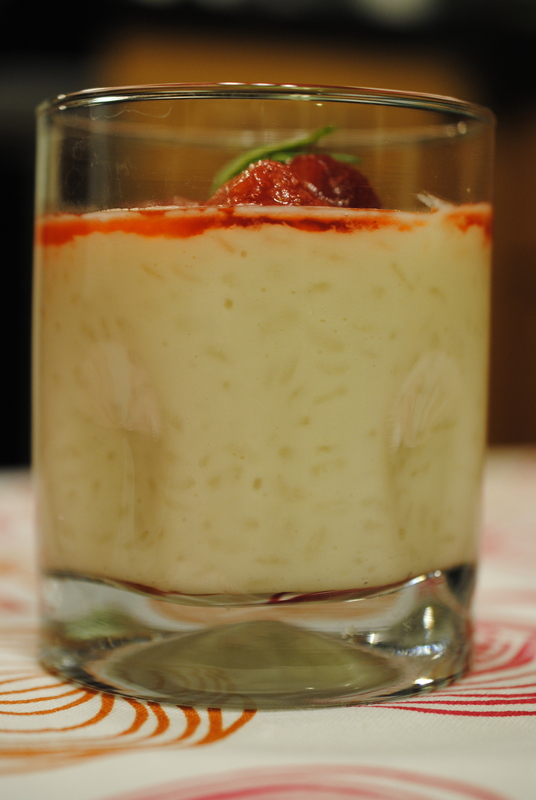 In a large saucepan, combine the sushi rice, sugar, salt and 1 cup of the milk mixture. Cook the ingredients over low heat, stirring, until the milk is absorbed- about 5 minutes. Then add in another cup of milk, stirring until the liquid is absorbed, about 5-10 minutes. Gradually, every 5-10 minutes add another cup of milk and keep stirring, until you use all but 1 cup. By then, the rice mixture should be thickened, and the rice will be cooked. Lastly, turn off the heat, pour in the last cup of milk, stir, and allow it to cool. 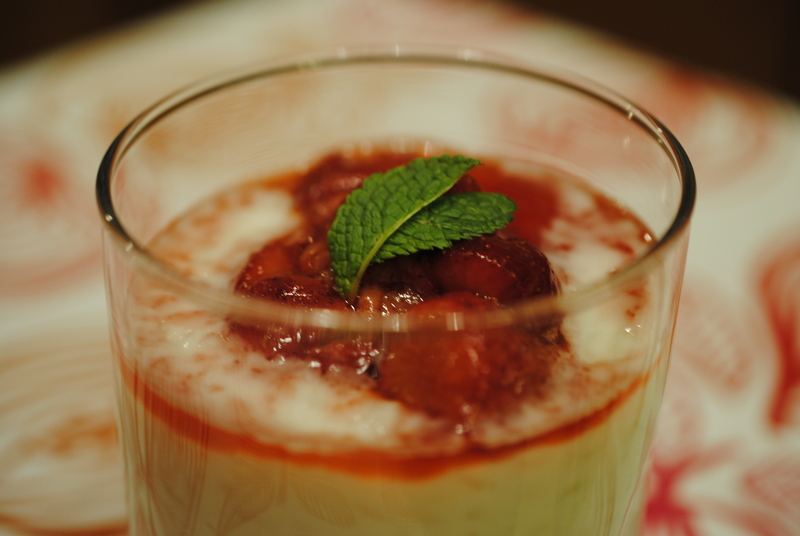 Serve with preserves, defrosted fruit, or fresh fruit (berries would be best). I thought this post was very fitting for our household today. The chosen dish for the The Food Matters Project was a curry, and today, Sam is leaving for a work trip to India. What a coincidence! This weeks recipe was chosen by Joanne of Eats Well With Others. Joanne had chosen the Curried Tomato Soup with Hard-Boiled Eggs from Mark Bittman’s book, The Food Matters Cookbook. Check out the comments section of this post to see how everyone else’s dishes turned out. I actually wasn’t a fan of Indian food until Sam made me dinner when we first started dating. 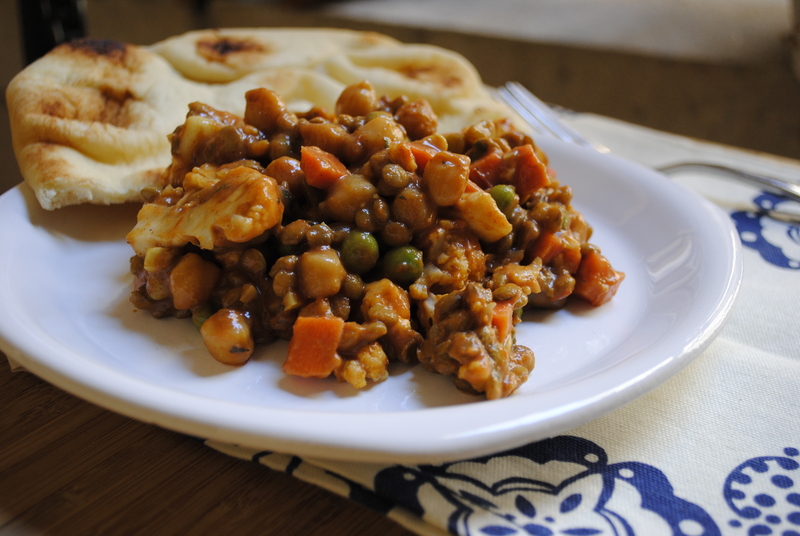 At that time he wasn’t eating meat, so the dish was full of veggies, chickpeas and a spicy sauce. I fell in love (not only with the dish)! Since then, Indian has definitely been one of our rotating flavors. The best part is that Indian dishes are very versatile, without meat it tastes even better. 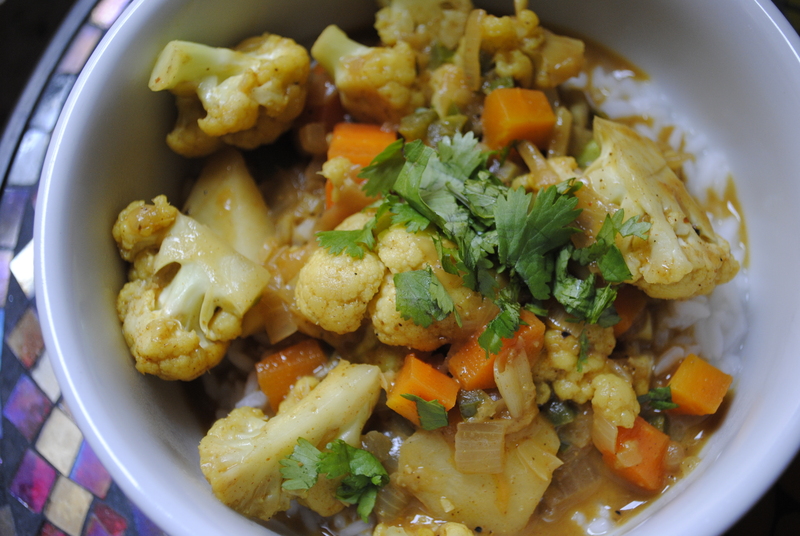 My favorite veggies to add are cauliflower and carrots, definitely try those if you haven’t already. Add some fresh naan and basmati rice, and you’ve got yourself a great dinner. Or even better leftovers. 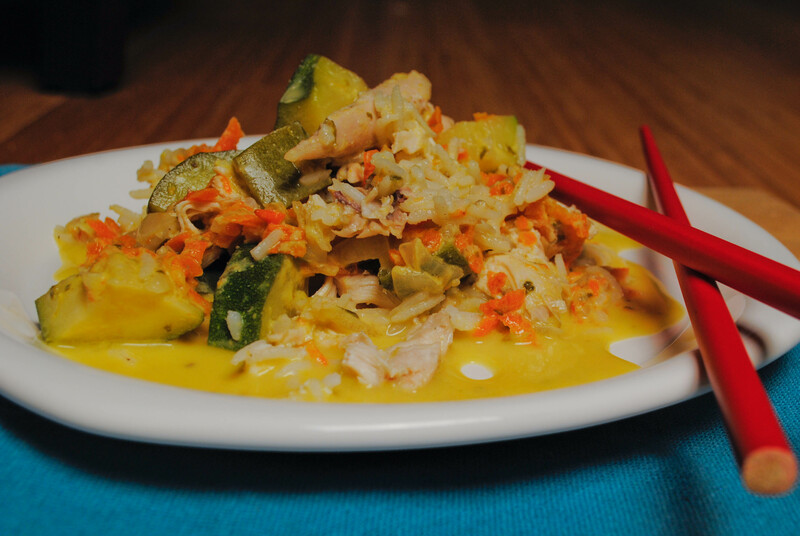 This dish was light, airy and had a silky sauce with the vegetables and the coconut milk. It’s something all of us can put together after work, or a couple of days in advance for a mid-week dinner. Mark Bittman even suggests freezing this, for future dinners. I realize that Mark Bittman’s recipe called for hard boiled or poached eggs, and other bloggers had also tried a fried egg on top. This weekends festivities included a giant omelet, and therefore eggs were not calling my name this evening. But if you do try this version, please let me know how it tastes! I served this over some basmati rice, but it can also be enjoyed with some naan. In a large skillet, heat up the olive oil. When it’s hot, add the onion, garlic, ginger and jalapeño. Cook the vegetables, stirring occasionally until the onions are soft for about 5 minutes. Then stir in the curry, chili powder, cinnamon and garam masala. Once the colors of the spices are stirred in, add the potatoes, carrots and cauliflower into the skillet. Cook them for about 2-3 minutes, then add the coconut milk and water. Mix all of these ingredients and allow them to cook for about 25 minutes on low heat. Once the carrots and potatoes are soft, sprinkle in the salt and pepper. When plating this dish, sprinkle cilantro on top.